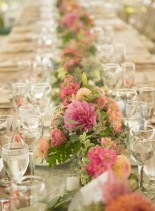 It was important to the couple to incorporate pieces of their hometowns. 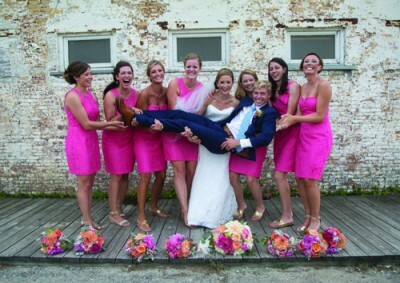 Vibrant blues and coral incorporated their love for Rhode Island’s ocean and Colorado mountain sunsets. Additionally, guests received gift bags with Yacht Club soda and seltzer, treats from The Cookie Jar and Boulder Canyon potato chips. 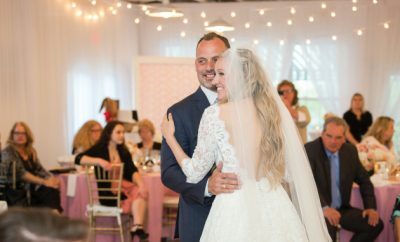 Alex wowed in her corded French rose floral lace gown with a sweetheart neckline for her ceremony, then changed into a beautiful custom designed cocktail dress made from her mother’s original wedding gown for the rest of the celebration. 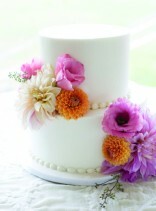 A two-tier silver pound cake with buttercream frosting flourished with bright orange, pink and white flowers was served with a scrumptious dessert buffet and mini ice cream cones. 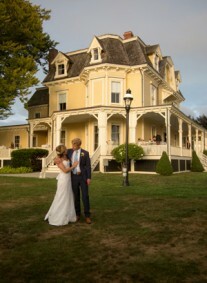 A tropical storm postponed the couple’s planned Kauai retreat; instead, they enjoyed Block Island, plus Bar Harbor and Kennebunkport, Maine. 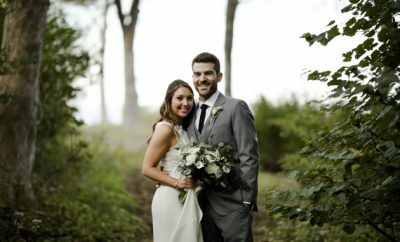 The couple then returned to Aspen where Wylie works as a consulting manager at Breo Solutions and Alex is a client services partner at Dovetail Solutions.